Still behind on reviews, mainly due to having our grandaughter here to stay and then being slightly unwell for a couple of days. So anyway, I'm going for three short ones again, two fantasies, one YA and one adult, and a crime anthology. First up, The Dark is Rising by Susan Cooper. Simply delightful, while at the same time being genuinely creepy! I loved the very wintery setting to this one - it would make an excellent Christmas or winter read for anyone of any age as the writing is mature and not at all simplistic. I felt the writer knew children and the way they act and talk very well indeed. To be honest, all of the characters are very well rounded and feel real, particularly The Walker in the shape of an old tramp, who is menacing Will at the start. Terrific second book to this series, I have the third volume, Greenwitch, on order and can't wait to read it. Next up, The Accidental Sorcerer by K.E. Mills, which was a birthday gift. Gerald Dunwoody is a third-grade wizard who got his qualifactions via a corresspondence course. As wizards go he's not exactly top of the heap and has ended up in a dead end job with a gov dept. checking code violations. And then he accidently blows up a factory, during which something odd happens with his magic powers. But he loses his job anyway and has to search for a new one. His high-flying friend, Monk Markham, points him towards an ad in a newspaper. It seems the king of neighbouring New Ottosland needs a new court magician - for some reason he can't keep one and has been through many in recent months. Gerald applies and is sent for. When he arrives with his luggage and talking 'bird' he meets the king's sister, Princess Melisande, an independant, very ordinary woman who it appears is actually running the country. Eventually, Gerald meets the king and receives a surprise. He is asked to do things a third grade wizard is not supposed to attempt, and shouldn't be able to do. But it seems he can. Things start to get out of hand as the, clearly unstable, king starts to make unreasonable demands. Why? What's he up to? And where did the sacked wizards actually go? On his quest to find some answers Gerald is in for some serious shocks and wishes more than once that he was back in his very boring old job. Great fun. I really enjoyed this fantastical romp with it's mad royals, pompous gov. officials, and mystical creatures of which I can't say too much or it would spoil the plot. The book is pacey with a great deal of humour and Gerald is an excellent main character with his down to earth attitude and underdog demeanor. Until I was given this book I'd never heard of it or seen it in bookshops - which is a shame as I think fantasy fans would enjoy it. It's book one of three in a series called 'Rogue Agent' and I shall be hoping to catch book two, Witches Incorporated, in the library sometime. And last but not least, Father Brown by G.K. Chesterton. I'm fairly sure I've already done a couple of posts about this anthology of Father Brown crime stories that I've been reading for ages, so I'll keep this brief. This particular anthology, which I found in a charity shop, includes stories from five of Chesterton's short story volumes about the detective cleric. Favourites include The Invisible Man, The Hammer of God, The Sign of the Broken Sword (which has one of the most atmospheric intros I've ever read), The Perishing of the Pendragons (a lovely Cornish story), The Blast of the Book and The Insoluble Problem. Those were my favourites but, to be honest, every story in the anthology was well written, clever, and very readable. I was very struck by Chesterton's gorgeous writing... so intelligent and amusing with skilful descriptions which set the mood and tone very effectively. I certainly plan to keep an eye out for complete editions of any of his Father Brown books or his novels of which I do actually own one: The Man who was Thursday. Highly recommend this author if you've never tried him. ~ Join anytime, but don’t start reading until January 1, 2009. The challenge ends December 31, 2009. ~ Choose a goal of reading 10, 20, or 30 essays during 2009, and then write a challenge post, linking back to this post. Feel free to copy and paste the above image into your challenge post. ~ Leave a comment here with the link to your challenge post, and I will put all the challenge participants on my sidebar. ~ You don’t have to list your essays ahead of time, just post them as you go. ~ At the end of the year, everyone who completes the challenge will be eligible for a giveaway - prize to be determined later. Probably a book of essays - since that would be appropriate. Doubtless I shall discover more along the way. Looking forward to this one immensely. 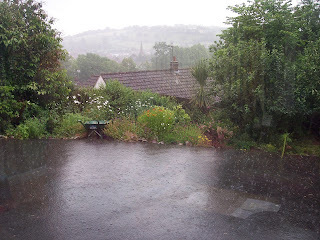 It's been busy the last few days but Sunday afternoon was free so I sat peacefully in the conservatory listening to heavy rain on the roof, reading stories from my Father Brown anthology by G.K. Chesterton and essays from John Betjeman in Trains and Buttered Toast. The latter I actually finished and counts for my Support your local library challenge being hosted by J.Kaye and also for my Non-fiction five challenge being hosted by Trish's Reading Nook. 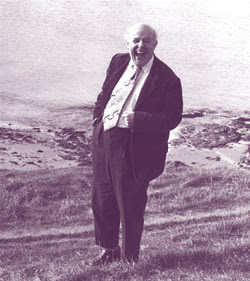 John Betjeman is most famous in the UK as a poet. Born in 1906, he died in 1984 and was in fact one of our Poet Laureates, but I've no idea how well known he is outside the UK. He was also a famous radio broadcaster and Trains and Buttered Toast is a selection of broadcasts made in the 1930s and 40s. They read like essays to be honest and I have to admit that I found some more interesting than others. 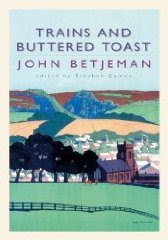 Betjeman was well known for his dislike of progress that came in the form of the ruination of the English countryside, ie. modern suburban sprawl. He loved Victorian architecture, old picturesque villages, the south west of England and, in particular, the county of Cornwall. All of these things are well represented in these broadcast essays. In Coming Home, or England Revisited he talks about the things he misses about England when he's abroad. Railway journeys, Women's Institutes, places such as Norfolk, Ludlow, Salisbury and so on. He wrote this in 1943 when he was the UK's press attaché in Dublin but nevertheless I still keenly identified with his feelings, as I feel that way way when I'm not here too! Not so much when I'm in the USA but every time we used to go to France I would be dying to get home and would actually cry when Plymouth came into view from the ferry. I have a feeling Betjeman would have understood. Not until you round a corner do you see any sign of Port Isaac at all. Then you see it all - huddled in a steep valley, a cove at the end of a combe, roofs and roofs tumbling down either steep hillside in a race for shelter from the south-west gales. A freshwater stream pours brown and cold along the valley, under slate bridges, between old houses, under the road and out into the little harbour. The trade of Port Isaac is really fishing. The promise of a dark night after a shoal of pilchards had been sighted; the sound of rowlocks and splashing of oars in harbour water, then boarding the fishing boat from the dinghy; the outside roar of the sea; the dark cliffs fading in twilight and dropping away as we move out to open sea; letting down the nets and drifting - those were the times! Unless, like me, you were a shocking sailor and sick all night and thanking God for dawn light and the nearing cliff of Varley Head as we made for home and harbour. He did a series called 'Book Talk' apparently and one of those, entitled Yesterday's Fiction deals with the joys of forgotten Edwardian fiction. I found this one very interesting as he was talking in 1944 and already many authors were out of fashion. Anthony Hope was a big favourite of Betjeman's... writer of The Prisoner of Zenda and other 'Ruritanian' novels. He also recommended The King's Mirror, Tristram of Blevit and The Dolly Dialogues none of which I've ever heard of. Other authors he recommends: George Gissing, Elizabeth Bowen, Rose McCaulay, E.F. Benson, Rider Haggard, 'Q' and many more. Two books: The Riddle of the Sands by Erskine Childs, a spy yarn which I'm pretty sure I saw in Waterstones recently, and Red Pottage by Mary Chalmondeley which Virago book I actually own, so will have to get that out to read. Bussell himself is so equisite that Baring-Gould tells the story of how he specially had orchids sent from London to match his clothes. (Bussell lived with his mother in a house Baring-Gould built and sang falsetto at village concerts to the amusement of the village and the distress of his mother.) 'We visited Huccaby' says Baring-Gould, 'to interview old Sally Satterly, who knew a number of songs. But she was busy, she had to do her washing. Mr. Bussell seated himself, inconsiderately, on the copper for the boiling, till she lighted the fire under it and drove him off. I had to run after her as she went about her work, dotting down her words, while Bussell followed, pencil and music book in hand, transcribing her notes'. It was fascinating to read more about this 'squarson' (mix of squire and parson in the village), who was quite content with his lot in the tiny Devon hamlet, with his wife and fourteen children, and never wished to be more than he was. So, did I love this book? Well, parts of it. Some of it didn't appeal much, he does bang on endlessly about progress and though he had a point, it does get a bit wearing. But when he's talking about his love of England, of Cornish villages, books that he loves or train journeys that no longer exist then he really is interesting and beautifully atmospheric in his writing. One to get from the library in my opinion. I just can't seem to keep up with reviews at the moment, and it's not even as though I'm reading that much more than normal. The usual six books in June and I'm on book five for July... so that probably is a bit more than usual for this month but nevertheless... So anyway, I'm going to do three quickies again to see if I can get myself back on track. 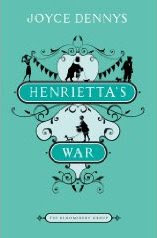 First up Henrietta's War by Joyce Dennys. 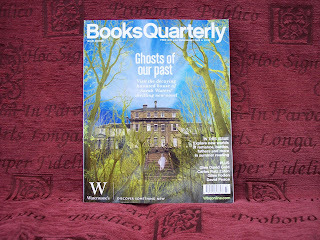 I saw this new book, from The Bloomsbury group, blogged about in several places and knew it was something I would enjoy. Basically, the story takes the form of letters written by Henrietta to her childhood friend, Robert, who is serving at the front during World War Two. She describes everyday life on the home front, digging for victory, sewing and knitting for the troops, blackout regulations, food rationing and so on. We meet various people who live in her Devon coastal village (we never learn where it is but my money's on Budleigh Salterton), Lady B who is relishing the war and writes to Hitler to tell him what she thinks of him, Henrietta's best friend, Faith, who worries that with clothing rationing she won't be able to dress fashionbly, The Conductor, who lusts after Faith, Mrs. Savernack who seems to be one scary lady, Henrietta's long suffering doctor husband, Charles, and so on. The whole thing is funny and charming and sometimes very sad when she mentions sons lost to people in the village or her worries about her own children fighting or helping in the war effort in London. A super book, lovingly illustated and just a joy really. 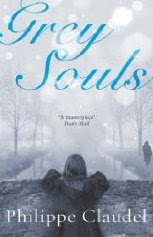 Next: Grey Souls by Philippe Claudel. This 'sort of' crime book, set during and after World War One, takes place in a French village. We're not told its exact location, only that it's very close to the front. We're also not told who the narrator is, but it's clear that he's a police investigator of some sort. And I say it's a 'sort of' crime book because yes, there is a crime - the murder of a ten year old girl - but the book is not just about that. It's about the people who inhabit the village and nearby town - the prosecutor, the judge, a female teacher who comes among them, neighbours, friends, the narrator's wife etc. and how certain events were connected, how the war changed people, and the consquences of people's actions. It's a complicated little book, very melancholy, even tragic, beautifully written and very, very French. It unfolds very much like a French film, which is no surprise as the author is apparently a film director as well as a writer. A small masterpiece but not one to read if you need cheering up. 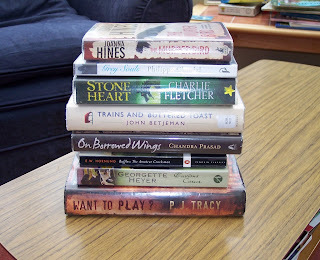 This was book 15 for my Support your local library challenge being hosted by J.Kaye. And lastly: New Moon by Stephanie Meyer. This is book two in the author's 'Twilight' series. Bella has settled back into life in Forks, WA, after the events of the the first book. It's her birthday and she goes to spend the evening with Edward's family, the Cullens. They're vampires of course and a chance accident when Bella cuts herself leads to chaos when one of the family can't control his bloodlust. The day after, Edward is remote and this continues until he announces that the family are leaving Forks. Bella is traumatised and spends several months in a 'living dead' sort of state. She is eventually pulled out of this by Jacob, a Native American boy, who helps Bella restore a motor cycle. At first Jacob is his usual happy self but then Bella realises the teenager has a problem. There's something going on with teenage boys in the village and things come to a head when, overnight, Jacob is no longer her friend - openly hostile in fact. And that's not her only problem. Victoria, the female member of the vampire coven who tried to kill Bella, is back with a vengeance. With Edward gone and Jacob appearing to want nothing to do with her, who will help protect Bella? These Twilight books get quite a lot of stick but I've actually really enjoyed the two I've read. New Moon is faster paced I think than Twilight, much more going on, more complications... I liked it better. It's not great literature but then who needs that all of the time? I regard these books in the same light as Harry Potter to be honest. In other words they're page turners... Meyer, like JKR, knows exactly how to tell a good story without frills or fripperies and, to my mind anyway, that's why they're so popular. Enjoyed it. So I'm having a bookish day here today with a visit to the library and Waterstones inbetween the torrential showers. 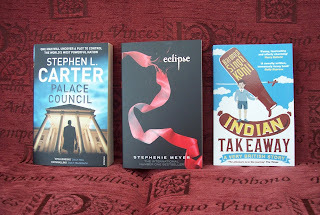 Palace Council by Stephen L. Carter is for my husband so I don't really know what that is but the other one, Indian Takeaway by Hardeep Singh Kohli, the comedian and TV presenter, is an investigation into his Indian and Scottish roots. I'm a bit of a fan so this sounded rather good. 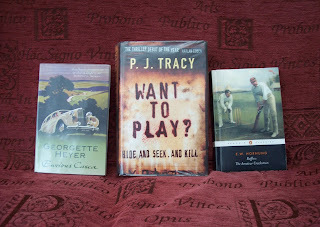 Three books from there - Another book by P.J. 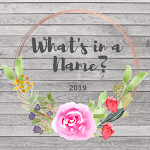 Tracy (see review below), the first in the series this time (I think...) A Georgette Heyer crime yarn, Envious Casca, and a short story collection by E.W. Hornung, Raffles: The Amateur Cracksman. And last but not least a quick book review - Snow Blind by P.J. Tracy. Well, the first thing to say here is that this is the 4th. book in this series. This is typical of me. I had no idea - Hubby just passed it on to me from his library pile, telling me that he quite enjoyed it, which is unusual enough in itself! It seems the first three books are not about these two detectives but more about a team of computer geeks who help the police - 'Monkeywrench' or something. They do appear in this 4th. book but not in any major way. Anyway, like my husband, I actually quite liked the book too. I liked the two detectives, found the plot pacey and interesting, and absolutely adored the snowy Minneapolis and Minnesota setting (blame Mary Tyler Moore!) I had some idea fairly early on of what was going on but it didn't spoil my enjoyment at all. I suppose if I have a complaint it would be that there does seem to be a slight implication in it that most men are wife beaters and that did get a bit wearing by the end of the book. The 'author' is actually two women, a mother and daughter team, which has got to be slightly unusual? Anyway, not a bad read... and I've just picked up the first in the series from the library. And now it's stopped raining at long last and the sun's out. So what books have you read over the past decade that stay with you? What are your favorites? 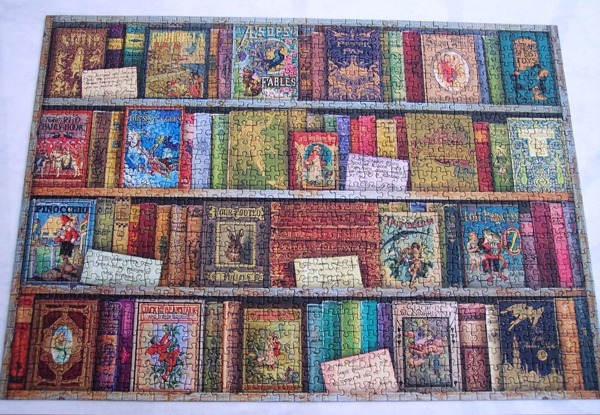 If you've always kept a books-read list, is there a theme to what you end up liking the most? Probably my favourite science fiction book ever, and I only read it for the first time about four years ago. A world completely covered in grass which has been settled by some not very pleasant people. And there is something about 'the hunt' that you immediately realise is all wrong but you're not told what. I've never read a book with a more well defined sense of extreme menace. Brilliant. A strange mix of religion and science fiction - but it works. A team of scientists and explorers headed by a RC priest go off on an expedition to the planet Rakhat. This one could be summarised by the phrase ' They meant well...' A brilliant 'first contact' kind of warning. I've only read the first three books in Hobb's nine strong 'Farseer, Liveship Traders and Tawny Man' sequence but even based just on those I still believe she's the one of the best fantasy writers around at the moment. Her world building and story telling abilities are second to none, imo. All three books in this trilogy are excellent but I particularly love this first book. I've a thing about elves and goblins anyway but this YA fantasy with a touch of romance where the 'hero' is a very strange looking goblin who kidnaps the heroine in order to marry her, was just perfect. I loved the humour and the underground setting and well... just everything about it really. I love all the Pern books but this particular little trilogy is one I read over and over. It's the story of Menolly who is a talented singer and musician, but on Pern girls never get to be harpers. Betrayed by her father, she runs away to a coastal area where she discovers tiny dragons and teaches them to sing. These books are quite simply perfection. It might seem odd to choose an Enid Blyton book for this meme but I believe in being honest and this lovely little book has stayed with me since I read it. Blyton conjures up such a wonderful feeling for the Scottish Isles, where it's set, that I haven't been able to get the atmosphere out of my head. 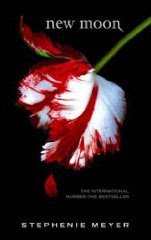 Vampires, history, East European travel... what more could a person want? Loved it. I could name any one of a dozen Regencies by Heyer but Frederica is the one I reread the most. I love its mix of a romance between the older man, Alverstoke, and the younger Frederica, and the way her younger siblings and a mad dog complicate the issue. Joyous. Francie Nolan's story. Born into poverty in turn of the century New York I found her story of survival completely inspirational. Beautifully told. WW2 story of how a well-to-do family fell to pieces as a direct result of the war. I worried endlessly about the children while I was reading it. The author follows in the footsteps of Mina Hubbard who made a 600 mile journey into the interior of Labrador in 1905 to restore the reputation of her dead husband. Ms Pratt canoes up river with a Native American as a guide and the resultant descriptions of scenery and happenings and discussions on Indian history and the future of the province, with her guide, are just fantastic. I want to go Labrador but realise it's never gonna happen. An account of the author's six months spent on lighthouses when he was a student - the people he met, lighthouse routines, cogitations etc. There is just something wonderful about this book. Durrell's account of his boyhood on Corfu with his eccentric family. Hard to get the atmosphere of Corfu out of your head once you've read it. I'm sure there are others I could add to this list - *many* more in fact - but I'll stop here before the list gets completely out of hand. So, is there a theme to the books that stay with me? Erm... I seem to be keen on sci fi and fantasy, but I already knew that. Truthfully, I don't think there is a pattern... I'm an eclectic reader and I think this list is evidence of it.